In response to the 2012 International Residential Code, section R503.1 requiring floor assemblies to be fire resistant rated, Truss Joistֿ® has answered with Flak Jacket fire protection. 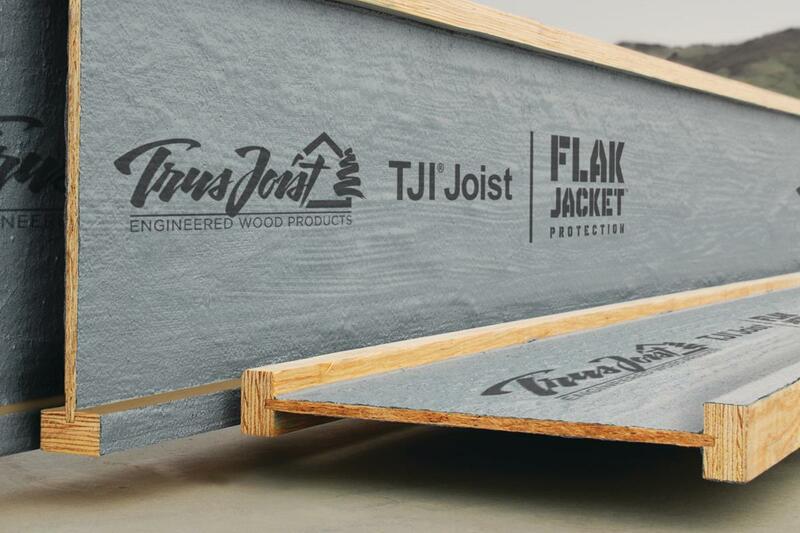 Truss Joist® joist with the Flak Jacket fire protection applied to the industry’s top I-joist brand with proprietary, factory applied coating that boosts the joists’ fire resistance. This combination enables them to meet the single and multi-family fire protection code that is required and provides a simple, cost-effective way to comply with section R501.3 (2012) and section R302.13 (2015). Joists are cut, drilled and handled the same as any other TJI® joist. No special hangers or fasteners are required. The Flak Jacket™ protective coating doesn’t change any of the structural properties of the joist. Guidelines for drilling holes in the joist are the same as any non-coated joist. Thee is no touch up that is required. No special tools, training or handling is required. Standard hangers are used for quick and smooth installation. Suitable for a new building design and construction.